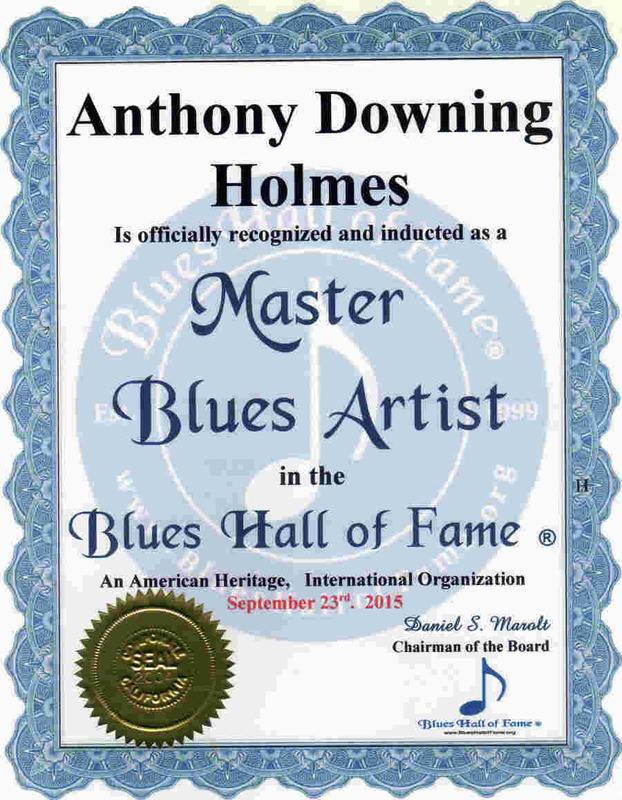 Anthony Downing Holmes . .
Anthony Downing Holmes Master Blues Artist 9-23-15. .
ANTHONY DOWNING HOLMES Bass Guitarist. In 7th grade in Florida Anthony started his music education on the flute and saxaphone, then his next band director, jazz great Cannonball Adderly, switched him to acoustic upright bass. He later took up electric bass and formed his own band. He has toured all over the world and played with Jimmie Reed, Jackie Wilson, Etta James, Big Maybel, Sam & Dave, Jesse Ferguson, Earl Gaines, Margie Hendrix, Shirelles, Freddie Empire. 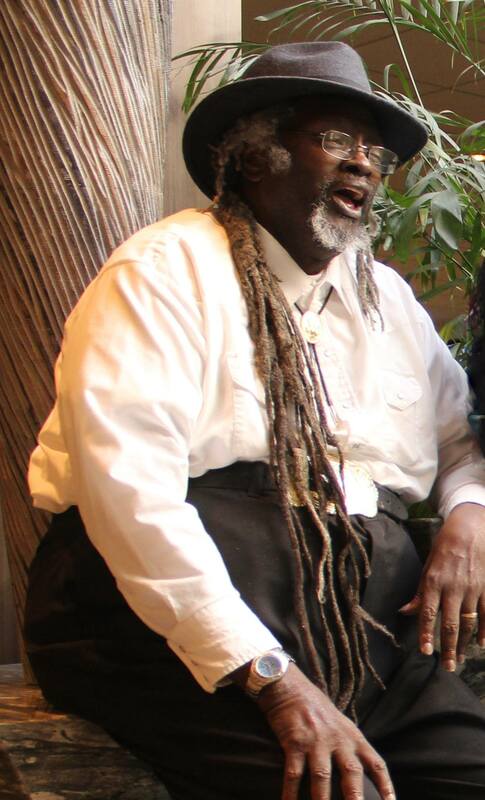 In Atlanta he played with many bands including the Paul Mitchell Trio in Bert Reynolds film Sharkeys Machine and blues singer Synethia included on her latest cd, the song I Dont Have To Run Away written by Anthony and his wife. In 2005 they moved to Spokane where he has played with many of the local bands in most genres. He has composed all types of music from a young age and is particularly adept at using and teaching use of recording/producing/composing with computer music software. Although he has had many basses, his current Conklin electric Bill Dickens 7 string and Palantino Upright are his favorites. In November of 1966, Earl Gaines came to Ft. Lauderdale, Florida to put together a touring band for his soon to be hit song The Best of Luck to You. In that band was CJ Rogers (guitar), Lil Irvin (organ), Alfonso Dames (drums), Charles Lloyd (sax), and I, Anthony D. Holmes on bass. We left Ft. Lauderdale going back to Nashville to rehearse. On the way we went over Lookout Mountain and coming down it was snowing real heavy (my first time seeing snow) and there was a farm truck broke down and we ran right into it. We were in a Dodge van with the battery behind the seat, and I was laying on the seat and fell onto the battery post which went thru my leg leaving a scar, Earl got cuts on his face from the windshield, Lil Ervin got part of his ear torn off. Earls manager, WLAC dj Hoss Allen sent a car to bring us on into Nashville from the hospital. The band lived in a roominghouse while developing the show; Hoss processed most of the band members hair to match Earls look. Our first gig was in Murfeesboro, TN where we were booked at $100 each but most of these gigs were actually paid by a percentage of the door and were lucky to get $25. We proceeded to Birmingham,AL, Bellglade,FL, Macon, GA and back to Nashville. Then on to Shreveport,LA, Dallas and Texarcana,TX, Memphis, TN and back to Nashville. We had trouble getting paid by club owners so Earl enlisted his brother to watch the door. In Winterhaven, FL a rowdy crowd demanded country music and a guy shot a hole in my amp when we told them we only played blues. Later, in Hotsprings, AR the club owner refused to pay us after the show and also kicked us out without our equipment even. The manager replaced the equipment and we continued, then back to Nashville. When the bookings dried up the band members moved back to Florida. Anthony Downing Holmes Personal Web Sites: . . . . . .. . . . . . . . . . . . .. . . .
. . . Latest CD: . . .